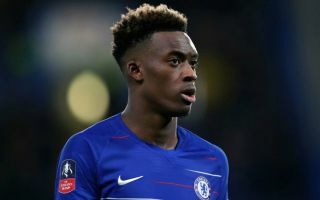 Chelsea boss Maurizio Sarri has told youngster Callum Hudson-Odoi to “respect the club” amid ongoing speculation over his future. As noted by Sky Sports, it had been claimed that the 18-year-old had handed in a transfer request, with Bayern Munich said to be bidding up to £35m to try and prise him away from Stamford Bridge. Given the youngster is making progress after an impressive pre-season and has made 11 appearances for the senior side so far this season, scoring two goals and providing three assists, he appears to be moving in the right direction for a player of his age. In turn, that should seemingly be enough to convince him to stay with Chelsea, but as rumours continue to circulate over his future, Sarri has sent him a not-so-subtle message over appreciating the work and time that the club have put into him to get him into this current position. “Callum is 18 and he has to respect the club, the academy, everything. He has time. If you are one of the best young players in Europe, maybe the academy helped you,” he is quoted as saying by The Guardian. Time will tell if Chelsea do convince him to stay, as he could prove to be a crucial option moving forward. As noted by Football365, Sarri told the media on Tuesday that the starlet wouldn’t be leaving before the deadline this week, and he has been told by the hierarchy that it’s likely he will stay beyond this summer too. That will be music to the ears of Chelsea fans, who will surely be desperate to see one of their own youth products come through the ranks and have the desired impact at senior level.